Background: Forgotten immunization appointment is a factor associated with low immunization uptake in Nigeria which could be addressed by a reminder-based intervention. Thus, there is a need to identify the type of reminder which would be preferred by the recipients which was the aim of this study conducted in Ilorin, Nigeria. Materials and Methods: A descriptive, cross-sectional study involving 363 mothers was conducted at two public-based immunization centers. Responses on willingness to receive text message or call reminders, preferred timing of appointment, and language of communication, willingness to pay, antenatal, and delivery characteristics were obtained via questionnaires. Data were analyzed with the Statistical Package for the Social Sciences version 20.0 software (IBM Corporation, Virginia, USA). Results: Text messages were preferred by 189 (52.1%) mothers and call by 174 (47.9%) mothers. A day prior to the scheduled appointment was the preferred timing by 322 (88.7%) mothers. The local language was preferred by 133 (76.4%) mothers who wanted calls, and 154 (81.5%) mothers who preferred text messages wanted English language. Logistic regression identified the odds of mothers preference for text message compared with calls was eightfold to fivefold among those aged 21–25 and 31–35 years, respectively compared with those aged <21 years, with each P < 0.005. Willingness to pay at most 50 naira for the reminders increased by eightfold among those who preferred text messages compared with calls (odds ratio 8.4; 95% confidence interval 2.8–25.1). Conclusion: Phone-derived reminders are a possible deployable tool for increasing immunization coverage in Nigeria. The optimal timing for sending reminders is the day preceding the appointment. Call reminders are preferred delivered in the local language, whereas English is preferred for text messages. Immunization remains a key strategic tool utilized in reducing the morbidity and mortality of vaccine preventable diseases. In Nigeria, where routine immunization is provided to children according to the National Program on Immunization (NPI) schedule, the immunization coverage for the third dose of diphtheria, pertussis, and tetanus recorded in 2015 was 54% which is lower than the expected target of 80%. Untimely receipt of vaccines and poor attendance at immunization clinics have been identified as a hindrance to childhood immunization in Nigeria. Some reasons attributable for the poor attendance include poor access, inadequate knowledge, client dropout, and forgetfulness of immunization appointments.,,,,, Reminder intervention via mobile technology may serve as a means of overcoming some of the aforementioned hindrances of immunization such as forgetting immunization appointments and thereby improve the vaccination coverage. There is an increase in mobile phone usage in Nigeria, with a total of 148 million global system for mobile communications (GSM) subscribers reported by the end of March 2016. Indeed, the GSM subscribers account for 99% of the mobile subscribers in Nigeria, whereas the other mobile technologies account for approximately 1% of the mobile subscribers. Thus, a reminder intervention strategy utilizing the GSM is likely to be readily accessible by the majority of parents. Reminders on mobile devices may be in the form of text messages or phone calls. Text messages are low cost, available for parents to read in their spare time, and readily sent out, but not easily utilized for explanations. Phone calls make explanation and clarifications easier, but may be a hindrance due to interruptions. To deploy a reminder-based intervention utilizing mobile devices, there is a need to identify the type of reminder which would be readily accessible, acceptable, convenient, and readily understood by the mother/caregiver as the recipients of the reminder. Therefore, the study’s aim was to determine the type of reminders via mobile phones preferred by mothers for immunization appointments and sociodemographic factors associated with preference for phone call or text message reminders among mothers/caregivers in Ilorin, Nigeria. This is a descriptive cross-sectional study conducted at the immunization centers of two public-based hospitals (General Hospital and Adewole Cottage Hospital) located in Ilorin West Local Government Area, Ilorin, Kwara State. The two hospitals are owned and managed by the state government. The immunization centers provide vaccinations to infants between Monday and Friday, with an average of 80 babies per month brought for birth dose vaccination. Other services offered at the immunization unit include nutrition and general health education which are all limited to the centers. Ilorin, the capital city of Kwara State situated in the North Central geopolitical zone of Nigeria, has a population of 854,737 according to the 2006 census, and the inhabitants of Ilorin are mainly of the Yoruba, Fulani, and Nupe tribes, and the major local dialect is Yoruba. Sample size determination: The formula used for estimating the minimum sample size required for the study was “n = (z2pq)/d2” with a “p” estimated at 62.6% from a previous study, and an observed difference of 5% or more taken as being significant. Therefore, the minimum sample size calculated was 360. However, 363 mother–baby pairs were recruited. Consisted of mother’s bringing their newborn for the birth dose vaccine, having a telephone contact number (personal and/or spouse), willingness to receive reminders via telephone, and consent to participate in the study. The study was reviewed and approved by the Ethical Board of the Kwara State Ministry of Health. Informed consent was obtained from the caregiver after clear explanation about the study had been given to the individual. This was a semistructured interview-based questionnaire which was deployed in either English or Yoruba language by two research assistants, with an average completion time of 4 min. The questionnaire was developed by the authors and had been pretested at another immunization centre (Children’s Specialist Hospital) prior to deployment for the study. Every mother–baby pair who presented at the two centers were asked whether they would want reminders for the immunization appointments and those who fitted the eligibility criteria were subsequently enrolled till the sample size was reached. This was completed over 4 months (August 15–December 15, 2016). The sociodemographic details of each mother–infant pair presenting for vaccination such as gender of child, age of mother, religion (Christianity/Islam/other), marital status (single/married/divorced/separated), level of education, and occupation of the child’s parents was recorded in the study proforma. The parents’ occupation was grouped into five groups according to the Oyedeji classification. Responses on whether mother had antenatal care (ANC), number of ANC visits and site of ANC, as well as place of delivery of the baby were sought and recorded. In addition, the birth order of the infant, number of mother’s children and history of previous vaccination for a sibling was noted. Responses on the type of reminder via mobile phone such as phone call, text message, both, or other type that the mother would prefer to receive for the appointment reminders was sought and recorded. Responses on whether the preferred language for communicating the reminder would be the mother’s local language or English were also sought and recorded. In addition, responses on the number of appointments for which the reminder should be given, and the preferred timing (day) to give the reminder were sought and recorded. Respondent’s willingness to pay for reminders, and the amount they were willing to pay for the reminders were documented. Subsequently, the mothers were educated about the importance of immunization, and informed about the number and timing of each expected immunization appointments. Data were analyzed using the IBM® Statistical Package for the Social Sciences version 20.0 (IBM Corporation, Virginia, USA) 2011 software. Continuous variables were expressed as mean and standard deviation (SD) if normally distributed and as median (interquartile range) if not normally distributed, whereas categorical variables were expressed as frequency and percentage. After the generation of frequency tables and simple proportions, the chi-square (χ2) was used to identify significant differences for categorical variables. Variables with a P-value <0.10 on bivariate analysis were included in the multivariate logistic regression model to identify factors associated with the preference of text messages compared with phone calls for immunization appointments. Analysis was not performed for the other options, because these two options (phone call alone, text alone) were the ones picked by the mothers. A P-value of <0.05 was considered statistically significant. A total of 536 mother–infant pairs presented during the study period; 10 (1.9%) mother–infant pairs were excluded due to the lack of ownership/access to a mobile phone, whereas 526 (98.1%) owned/had access to a phone. Among the 526 mother–infant pairs with access/ownership of a phone, 163 (31.0%) mothers did not want reminders, whereas 363 (69.0%) were willing to have either phone call or text reminders via mobile phone and were enrolled in the study. Of the 363 mothers enrolled, 344 (94.8%) mothers had a personal phone, whereas 19 (5.2%) mothers had access to phones via their spouses. There were 181 (49.9%) male and 182 (50.1%) female infants. Eight (2.2%) of the infants had single mothers and 352 (97.8%) infants had married mothers. Majority of the infants had Muslim parents (262, 72.2%) and 101 (27.8%) infants had Christian parents. The overall mean (SD) age of the mothers was 28.14 (4.82) years, with a range between 17 and 45 years. 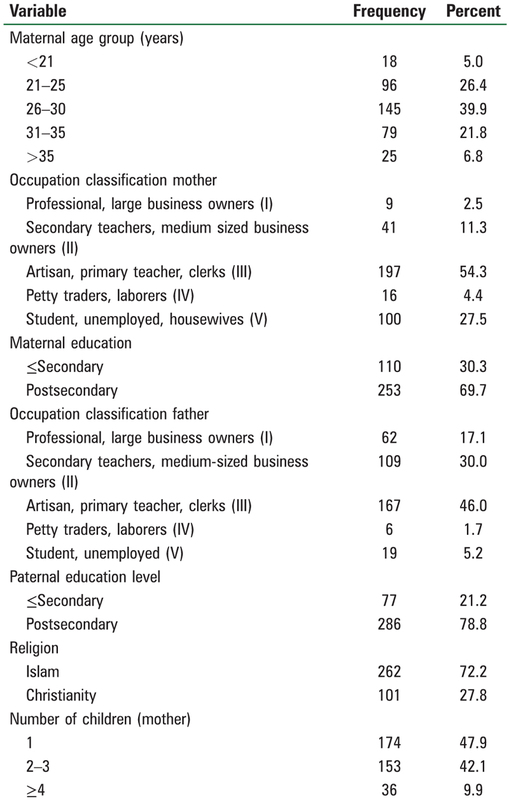 Artisans and primary school teachers were the predominant occupations of 197 (54.3%) mothers and 167 (46.0%) fathers. Majority (69.7%) of the mothers had postsecondary level of education, and 268 (73.8%) mothers had either one or two children as shown in [Table 1]. Text messages were the type of reminder preferred by 189 (52.1%) mothers, and phone calls were preferred by 174 (47.9%) mothers, P = 0.431. Neither a combination of phone call and text message reminders nor other type of reminder was chosen by the mothers. [Table 2] shows a higher proportion of mothers with postsecondary education preferred receiving text messages to phone calls, P = 0.002. A significantly higher proportion of the mothers aged between 21 and 35 years, preferred text messages reminders to call reminders, P = 0.037. There was no significant relationship between mothers’ reminder preference and ANC attendance or place of delivery, each P > 0.05 as shown in [Table 2]. Majority (88.7%) of the mothers preferred to receive the reminder a day prior to the scheduled appointment, 293 (80.7%) mothers wanted reminders for all appointments [Table 3]. 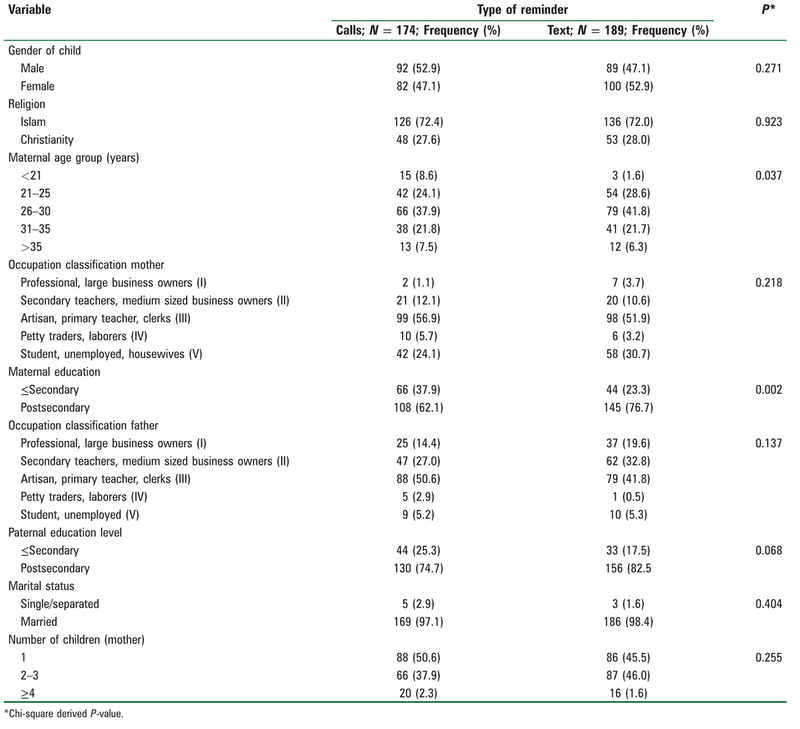 A higher proportion of mothers who preferred phone call reminders wanted the reminder given in their local language, whereas a higher proportion of mothers who preferred text messages wanted the reminder in English language, P ≤ 0.001 as shown in [Table 3]. Respondents who were willing to pay for the reminders were higher in the text message group than the phone call group mothers [Table 3]. The median (interquatile range) amount of money mothers’ were willing to pay for the reminders was 50.0 (0.0–1000.0) naira. Variables identified with a “P” value <0.05 in [Table 2], [Table 3] were entered into a binomial logistic regression model which had a goodness-of-fit measure that was statistically significant (chi-square = 157.267; df = 10 and P ≤ 0.001) with Cox & Snell R2 of 35.2% and a Nagelkerke R2 of 46.5 whereas the classification plot effect changed from 52.1 to 81%. [Table 4] shows that mothers who wanted text message had a 17-fold increased odds of preferring English as the language of the reminder. Mothers who preferred text messages were eight times more likely to pay a maximum of 50 naira for the reminders. The odds of mothers preference for text message compared with phone call reminders ranged from eightfold to fivefold among those aged between 21–25 and 31–35 years when compared with those aged <21 years, with each P < 0.005. A higher proportion of mothers in the current study preferred text messages which is similar to some earlier findings reported in the United States,,, but differs from the findings reported in Nigeria that identified phone calls as the major preference.,, The findings of text message as the more preferred type of reminder may be due to its low cost, fast delivery, and reduced interference with daily activities. In addition, text messages are likely to be accessible at a later time for mothers who are unable to read the message initially, but phone calls need to be received and a mother who is busy at the time of the call misses the call. On the other hand, phone calls enable better interaction between the healthcare provider and the person receiving the call, such that explanations or clarifications may be sought from the healthcare provider. Phone calls have been shown to be more expensive than short message service (SMS) in health-based interventions, and may be a cause of interruptions during mother’s various activities. The language for the reminders was a major factor influencing the type of reminder in the current study as evident from the fact that mothers who wanted text message had a 17-fold increased the odd of preferring English as the reminder language. The current study findings of English language as the preferred language for text messages is similar to the report of Balogun et al. 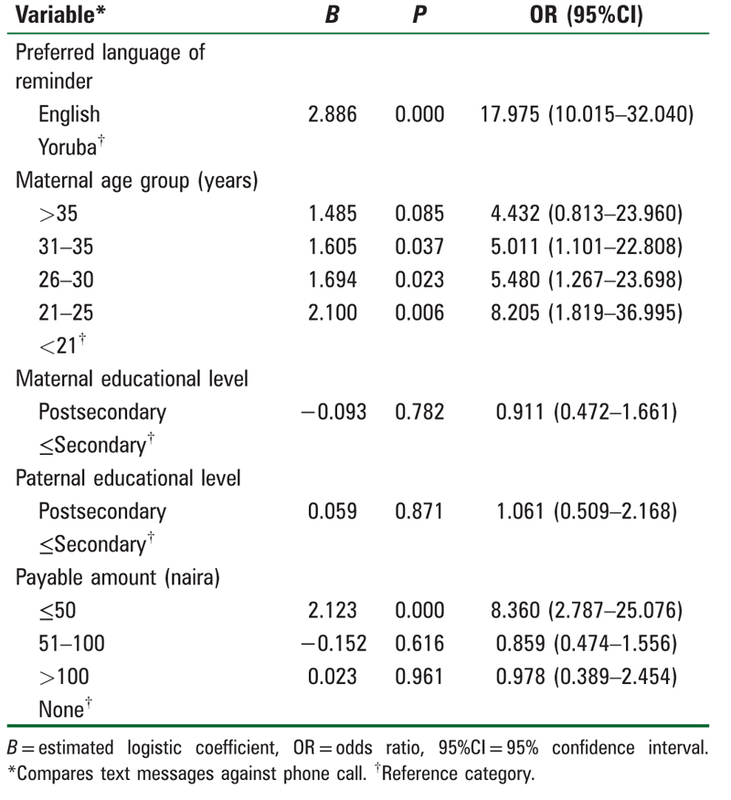 It is noteworthy that 44% of the mothers preferred the reminder to be provided in Yoruba, the predominant language spoken in the study locale, and these accounted for a higher proportion of those who preferred phone calls. In Nigeria, the official language is English but several other languages exist, though Yoruba, Hausa, and Igbo are the three major languages, in the different geographical zones of the country. Reminders provided need to be concise, and delivered in a language easily understood in view of the diverse language and ethnic groups in the country. Thus, strategies involving the incorporation of reminders to improve vaccination uptake should take into consideration the type of reminder to be utilized and the diverse languages spoken in Nigeria. In addition, mothers have to be literate to be able to access the text message and this is supported by the preference of a higher proportion of mothers with postsecondary education to receiving text messages compared to phone calls in the current study. Although it was not a significant finding in the regression model of the current study, other authors had reported a preference for text messages among mothers with postsecondary education.,, This highlights the need for emphasis on female education. Almost 57% of the mothers in the current study were willing to provide personal payment for the reminders, which is slightly higher than the 53 and 42.8% reported in Lagos and Ibadan, respectively., This current study finding of mothers’ willingness to pay may demonstrate the importance placed on the immunization of children by the parent. On the average, SMSs cost about 4 naira per page and at a rate of 4 naira per SMS reminder for each appointment, the cost implication for the five scheduled immunization visits is approximately 20 naira. This amount is easily affordable without putting a strain on the household purse as demonstrated by the fact that mothers who preferred text messages had an increased eightfold odd of opting to pay ≤50 naira for the reminders. The fact that the majority of the mothers willing to pay are opting for <50 naira has important implication and should be taken into consideration by the government and public health program planners in utilizing reminders as an intervention strategy for improving vaccination uptake.Mothers in the age group of 21–35 years were likely to prefer text messages to phone calls in the current study and the findings that women of this age bracket preferred text messages is similar to the report of Balogun et al. in Lagos. However, it is in contrast to the findings of Sadoh and Okungbowa and Brown et al. who reported no association between maternal age and the preferred type of reminder. This age bracket is the optimal age of child bearing among women, and the increased disposition of these mothers to SMS may be attributable to an open mind and willingness on the part of the mothers to embrace methods that would promote a healthful life for their children. A study in Bangladesh had identified mothers in this age group as more likely to complete immunization for their children due to these mothers being more knowledgeable about modern health care services. Text messages were preferred to phone calls for the reminders on immunization appointment by a majority of mothers, whereas the optimal timing for sending reminders was the day preceding the scheduled appointment. Call reminders are preferred delivered in the local language, whereas English is preferred for text messages. The mothers who wanted SMS reminders were likely to be aged between 21 and 35 years, preferred English as the utilized language of the reminder, and were willing to pay a maximum of 50 naira for the reminders. Phone-derived reminders should be considered as a deployable tool for increasing childhood immunization coverage in Nigeria. Despite the findings of the study which reflects the likely norm in urban settings, the limitation of the study is that it was hospital-based and conducted in the urban community where the use of telecommunication devices is common. Thus, there is the need for a community-based study, especially in the rural community, to reflect the picture in that setting. WHO. Estimates of Immunization Coverage: 2015 Revision July, 6 2016. Nigeria: WHO and UNICEF. Available from: www.who.int/immunization/monitoring_surveillance/data/nga.pdf. [Last accessed on 2017 May 7]. Sadoh AE, Eregie CO. Timeliness and completion rate of immunization among Nigerian children attending a clinic-based immunization service. J Health Popul Nutr 2009;27:391-5. Abdulraheem IS, Onajole A, Jimoh A. Reasons for incomplete vaccination and factors for missed opportunities among rural Nigerian children. J Public Health Epidemiol 2011;3:194-203. Oladokun RE, Adedokun BO, Lawoyin TO. Children not receiving adequate immunization in Ibadan, Nigeria: What reasons and beliefs do their mothers have? Niger J Clin Pract 2010;13:173-8. Ibraheem RM, Bello AO, Adeboye MA, Adeyeba DT, Mohammed MJ. Missed vaccination opportunities at a secondary health facility in Ilorin, Nigeria. JCMPHC 2016;28:31-7. Onyiriuka A. Vaccination default rates among children attending a static immunization clinic in Benin city, Nigeria. J Biol Med Res 2005;4:71-7. Ubajaka F, Ukegbu A, Okafor N, Ejiofor O. The prevalence of missed opportunities for immunization among children utilizing immunization services in Nnamdi Azikwe University Teaching Hospital, Nnewi. J Biol Agric Healthc 2012;6:112-9. Nigerian Telecommunications (Services) Sector Report Q1; 2016. Available from: http://www.nigerianstat.gov.ng. [Last accessed on 2017 May 6]. Sadoh A, Okungbowa E. Nigerian mothers opinion of reminder/recall for immunization. Niger J Paediatr 2014;41:38-42. Oyedeji GA. Socio-economic and cultural background of the hospitalized children in Ilesha. Niger J Paediatr 1985;12:111-7. Hofstetter AM, Vargas CY, Kennedy A, Kitayama K, Stockwell MS. Parental and provider preferences and concerns regarding text message reminder/recall for early childhood vaccinations. Prev Med 2013;57:75-80. Ahlers-Schmidt CR, Chesser AK, Paschal AM, Hart TA, Williams KS, Yaghmai B et al. Parent opinions about use of text messaging for immunization reminders. J Med Internet Res 2012;14:e83. Kharbanda EO, Stockwell MS, Fox HW, Rickert VI. Text4Health: A qualitative evaluation of parental readiness for text message immunization reminders. Am J Public Health 2009;99:2176-8. Balogun MR, Sekoni AO, Okafor J, Odukoya OO, Ezeiru SS, Ogunnowo BF et al. Access to information technology and willingness to receive text message reminders for childhood immunization among mothers attending a tertiary facility in Lagos, Nigeria. SAJCH 2012;6:76-80. Brown VB, Oluwatosin A, Ogundeji MO. Experiences, perceptions and preferences of mothers towards childhood immunization reminder/recall in Ibadan, Nigeria: A cross-sectional study. Pan Afr Med J 2015;20:243e. Kannisto KA, Koivunen MH, Välimäki MA. Use of mobile phone text message reminders in health care services: A narrative literature review. J Med Internet Res 2014;16:e222. Chen Z, Fang L, Chen L, Dai H. Comparison of an SMS text messaging and phone reminder to improve attendance at a health promotion center: A randomized controlled trial. J Zhejiang Univ Sci B 2008;9:34-8. Wikipedia Contributors. Languages of Nigeria. Wikipedia, The Free Encyclopedia. Available from: https://en.wikipedia.org/w/index.php?title=Languages_of_Nigeria&oldid=77915964619. [Last accessed on 2017 May 7]. Bewley S, Davies M, Braude P. Which career first? The most secure age for childbearing remains 20–35. BMJ 2005;331:588-9. Rahman M,, Obaida-Nasrin S. Factors affecting acceptance of complete immunization coverage of children under five years in rural Bangladesh. Salud Publica Mex 2010;52:134-40.